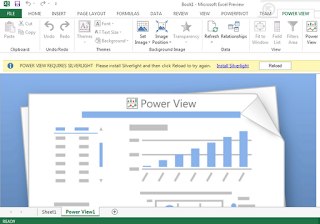 Trouble installing Silverlight in PowerView design mode for Excel 2013 in Windows 8? At least I had, no matter how many times I tried to install Silverlight through the pop-up bar in Excel I kept getting errors. But the solution was fairly simple, just open a new Internet Explorer 10 window and install Silverlight from your browser instead, and tada! You’re good to go.